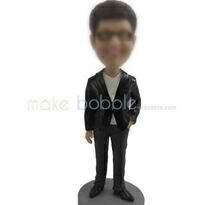 Personalized man in suit bobbleheads - a love more than a gift! Having a workplace Bobblehead visible on your desk or in your workspace clearly states the honest commitment to your chosen career or job. Whether you are a doctor, lawyer, engineer or fire-fighter, or simply one of the thousands of important people who make our system work smoothly and successfully, a workplace Bobblehead is bound to offer inspiration to both you and your colleagues.